Comparison of forage growth of multi-cut (left) and single-cut (right) harvest sorghum plots in late September. Akins is an extension dairy scientist with the University of Wisconsin based at the Marshfield Agricultural Research Center. Remick is a graduate research assistant. Forage production on dairies often focuses on optimizing forage quality and yield for lactating cows; however, this can cause a shortage of moderate-quality forage for dairy heifers, especially bred heifers. Dairy heifers are often fed high-forage diets with corn, alfalfa, or grass silages. Corn silage is high energy (70 to 75 percent total digestible nutrients [TDN] on a dry matter [DM] basis), which exceeds the needs of 900 to 1,200-pound heifers that require 60 to 62 percent TDN. These high-quality forages are also lower in fiber and cause higher feed intakes. Sorghum and sorghum-sudangrass hybrids are forage options that have a moderate nutritive quality (higher fiber, lower energy) and could control feed intake and weight gain. Also, sorghums have a lower cost of production, reduced seed costs, and lower nutrient and irrigation needs, which help reduce heifer-raising costs. New sorghum types (photoperiod sensitive) are now available as forage options. These are being utilized in the southern United States but also have potential in the North. Photoperiod-sensitive hybrids stay vegetative until daylight shortens to 12 hours and 20 minutes, allowing the plant to accumulate greater yields and have lower energy due to their lack of grain production. The potential to grow this forage using similar management to corn (direct chopping at desired moisture) makes it easier to incorporate the crop into current production systems. Research we are conducting is looking at photoperiod sensitive, conventional, and brown midrib (BMR) types of sorghum and sorghum-sudangrass. This article will provide an overview of our completed research on planting date optimization and harvest strategies along with recommendations for growing sorghums in cooler climates. We established plots at the Marshfield and Hancock Agricultural Research Stations as these locations have stark differences in soil types and management. At Marshfield, the clay-based soil is heavier, which makes growing sorghums more challenging. Hancock is in the Central Sands region and a more ideal soil because sorghum is better able to deal with lower soil moisture. We evaluated two planting dates (early and mid-June) and harvest schedules (one or two harvests) with the two harvests taken in early August and after a killing frost in the fall (usually early October). The single harvest was taken according to forage maturity or after a killing frost for the photoperiod-sensitive hybrids. Overall, later planting had a negative impact on yield with 1 to 2 tons of DM per acre lower yields. The exception was at Marshfield where heavy rains and soil crusting delayed emergence of the early planting. Coupled with wet conditions, our planting depth of approximately 1.5 inches also delayed and reduced germination and yields on the heavier soils. The planting depth had less impact on Hancock’s sandy soils. Harvest strategy looks to impact yield more significantly than planting date with single-harvest forages having 1.5 to two times greater yields than multiple cuts. The graph shows how sorghum type and harvest strategy affected yields. 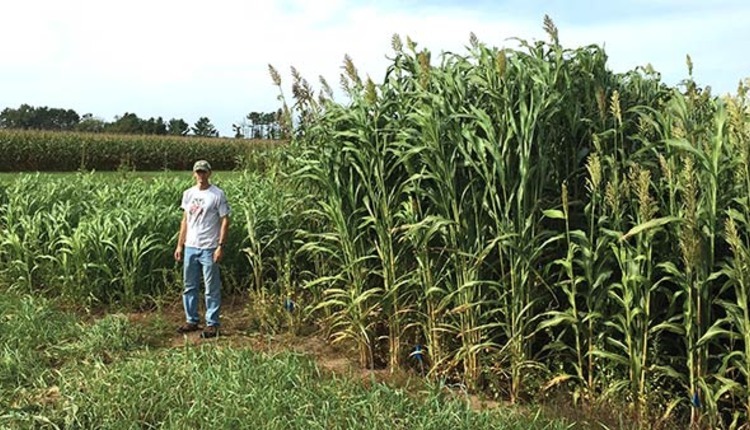 The single-harvest, photoperiod-sensitive hybrids and conventional sorghum-sudangrass had greater yields (9 to 11 tons of DM per acre) than the BMR hybrids, while corn and forage sorghum were intermediate. The photoperiod-sensitive and conventional sorghum-sudangrass both had the highest yields using two harvests (6 tons of DM per acre). Sorghum-sudangrass and sudangrass had more similar yields using either one or two harvests than other sorghum types due to greater tiller production than the forage sorghums. In addition, the single harvest yields at Hancock were 3 to 4 tons of DM per acre greater than at Marshfield; this was likely due to faster emergence and better soil conditions. Overall, compared to corn, sorghum forages generally produced similar or greater yields of moderate-quality forage using a single-cut system. Forage quality was as expected with lower energy for conventional and photoperiod-sensitive sorghums compared to corn (67 percent TDN). The TDN levels for sorghums were between 55 to 62 percent using a single harvest and 63 to 67 percent using two harvests. The BMR hybrids had 3 to 4 percentage units greater TDN than nonBMR sorghum hybrids and were more similar to corn. Neutral detergent fiber (NDF) concentrations were greater for sorghums than corn silage (48 percent NDF) using a single harvest; this was especially true for the photoperiod-sensitive hybrids. Sorghums ranged in NDF from 52 to 62 percent for a single harvest and 60 to 65 percent using multiple harvests. Fiber digestibility was higher using multiple harvests ranging from 62 to 70 percent with BMR hybrids having higher NDF digestibility. Harvesting in fall using a single harvest caused lower fiber digestibility (42 to 58 percent NDF digestibility), especially for sorghum hybrids with higher yields. Brown midrib hybrids using a two-harvest system would be a better fit for young, prebreeding heifers while the conventional and photoperiod-sensitive cultivars would help control feed and energy intakes for pregnant dairy heifers. Nitrates can be a major concern with sorghums. During periods of stress and slow growth such as drought, cool temperatures, or after a frost, the conversion of nitrogen to protein is slowed, causing a buildup of nitrates in the plant. In our studies, plant nitrate concentration was dependent on both location and harvest strategy. At Hancock, nitrates remained at low levels due to the sandy soil not holding as much of the soil nitrogen. Single-harvest sorghums at Marshfield also had nitrate levels below the recommended threshold of 1,000 parts per million (ppm) of nitrate-nitrogen. However, using two harvests at Marshfield resulted in nitrate levels above 1,000 ppm, especially for the second harvest in fall after a frost. Waiting a few days after a frost before ensiling and using a higher cutting height can reduce nitrate concentrations. Testing is always advised when harvesting sorghums to monitor this risk. Grazing or green chopping is not recommended soon after a frost. Wait for soil temperatures to reach 60°F to 65°F to ensure fast seed germination. Plant in early to mid-June to ensure forage reaches maturity (soft to hard dough for fall harvest) if using a single harvest strategy. Later planting may result in immature forage and lack of dry down. Planting depth is very important; in heavy soils, aim for 0.5 to 1 inch and 1 to 1.5 inch for sandy soils. In heavy soils, avoid planting prior to a forecasted significant rainfall as soil crusting drastically reduces emergence. Dry down for a fall harvest is slow for photoperiod-sensitive cultivars, even after a frost; wider row spacings (15 to 30 inches) may help improve drying, but research is needed. Forage may need to be cut and wilted to dry prior to harvest. Use of conventional or photoperiod-sensitive sorghums is suggested for pregnant heifers, while BMR types may offer some flexibility in feeding to lactating cows or young heifers. This article appeared in the January 2018 issue of Hay & Forage Grower on pages 6 and 7.